It is challenging to disperse lipophilic substances in a validated cytotoxicity assay, especially for compounds with log Kow greater than or equal to 5 that may show false negative results. The purpose of this study was to explain the challenges in conducting a cytotoxicity validated test of lipophilic substances: Minthostachys setosa, Pimenta pseudocaryophyllus, and Drimysbrasiliensis essential oils. Additionally, we compared the equivalence of Neutral Red (NR) and 3- (4,5-dimethylthiazol-2-yl) -5- (3- carboxymethoxyphenyl) -2- (4-sulfophenyl) -2H -tetrazolium, inner salt (MTS) in detecting cell viability. The Hydrophile-Lipophile Balance (HLB) technique was used to evaluate the dispersion of essential oils and cytotoxicity in accordance to the guidelines of the OECD / GD 129 validated cytotoxicity assay. We compared the equivalence of vital dyes by TOST equivalence test. According to the results, we demonstrated the possibility of using other ways to disperse the lipophilic substances. Based on the HLB theory, we selected polysorbate 20 as the best solubilizing agent of the essential oils studied in D10 culture medium. Keywords: Cytotoxicity, essential oil, Minthostachys setosa, Pimenta pseudocaryophyllus, Drimysbrasiliensis, neutral red, thiazolyl blue tetrazolium bromide. Keywords:Cytotoxicity, essential oil, Minthostachys setosa, Pimenta pseudocaryophyllus, Drimysbrasiliensis, neutral red, thiazolyl blue tetrazolium bromide. Abstract:It is challenging to disperse lipophilic substances in a validated cytotoxicity assay, especially for compounds with log Kow greater than or equal to 5 that may show false negative results. 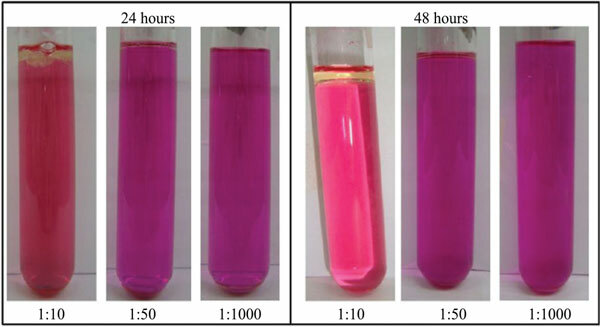 The purpose of this study was to explain the challenges in conducting a cytotoxicity validated test of lipophilic substances: Minthostachys setosa, Pimenta pseudocaryophyllus, and Drimysbrasiliensis essential oils. Additionally, we compared the equivalence of Neutral Red (NR) and 3- (4,5-dimethylthiazol-2-yl) -5- (3- carboxymethoxyphenyl) -2- (4-sulfophenyl) -2H -tetrazolium, inner salt (MTS) in detecting cell viability. The Hydrophile-Lipophile Balance (HLB) technique was used to evaluate the dispersion of essential oils and cytotoxicity in accordance to the guidelines of the OECD / GD 129 validated cytotoxicity assay. We compared the equivalence of vital dyes by TOST equivalence test. According to the results, we demonstrated the possibility of using other ways to disperse the lipophilic substances. Based on the HLB theory, we selected polysorbate 20 as the best solubilizing agent of the essential oils studied in D10 culture medium.